Extensive interview with Axel online! Almost spring - that feels wonderful! You have many possibilities to listen to Blues and Boogie Woogie piano this spring time. Axel Zwingenberger is on tour through Sain, Austria and Germany. Don't miss out on visiting one of his live concerts! All concert dates are linked on Axel's website! Have a look at the tour schedule for detailled infos! Photos of Axel's activities can be found on his facebook fan page. Please feel free to sign up to Axel's newsletter to stay tuned and get informed about venues and start of ticket presales in time. You can listen to Axel's music on this web site! Click through the shop and get examples of every single CD! The new and re-release of a legend: 2 CDs and a DVD together in a digi box. 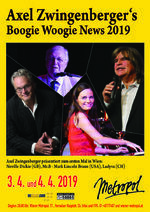 News and concerts in Axel Zwingenbergers mailing list. Register now!